Lee Anderson, a retired United Airlines pilot (his wife Cathryn, was a flight attendant), is now a realtor and owner of a tiny .4 acre Pinot Noir vineyard planted to clones 115 and 667 in 2001. The winery’s inaugural Sonoma Coast Pinot Noir from the 2004 vintage was crafted by winemaker Leslie Sisters and was released in 2006. Production is about 200 cases annually. Lee also operates the Anderson Oaks Vineyard B&B, a private room in his residence that is for rent through www.airbnb.com. No winery website. This property has a long history of ownership dating back to 1852 when Sarah and Richard Whitten immigrated by wagon train to Oregon from Cincinnati, Ohio and settled in Rosemont. A Czech-republic immigrant from Prague, James Spousta bought the farm in 1915 and later sold it to K.B. Hall for whom he worked. Hall built the farm into a world-class equestrian center. In the 1950s, a lumbar baron family, the Morleys, purchased the farm that was 125 acres at the time. In 1996, Jerry and Leslie Marshall (pictured below) bought 36 acres including the barns and original Spousta house from Mrs. Morley’s daughter Elizabeth Douris. They had lived a half mile from the farm and equestrian center for twenty-five years and had admired the property all those years. Jerry was an airline pilot with American Airlines who had been raised on a farm in western Pennsylvania and always had the desire to live on a working farm. He retired from the airline in December 2000 and has since worked to restore the property to its original grandeur. A vineyard was planted to Pinot Noir, Pinot Gris and Marechal Foch from 1997 to 2008 (now 20 acres), and a boutique winery was established. Wines are produced from estate and purchased grapes. Jerry says, “It truly is a joy to live and work on a fully functioning farm. Our family is all involved in some capacity and this involvement will pass through our lineage.” Tasting is available on Sundays year round and holiday weekends. Visit www.oswegohills.com. Owner Bob Kelly handles all aspects of wine production at this boutique winery while working as an airline captain for Alaska Airlines since 1997. He was a fighter pilot in the U.S. Navy, both active duty and reservist from 1988 to 2008 and is considered an expert in military aviation. Kelly established the winery in 1995 and produces about 1,500 cases of Santa Barbara County Pinot Noir, Chardonnay, Syrah and some Napa Valley Cabernet-based wines from purchased grapes. Kelly also is involved in custom vineyard installation for commercial and residential applications. The winery and tasting room above the winery are located at 35 Industrial Way in Buellton, and are open Thursday through Sunday. I met Kelly at the 2012 World of Pinot Noir and thoroughly enjoyed his Pinot Noir offerings. Robert Morus founded Phelps Creek Vineyards to focus on estate grown Pinot Noir and Chardonnay. He was raised in the San Francisco Bay area and experienced the Northern California wine explosion first hand. After serving in the U.S. Air Force, he became a Delta Airlines captain and continues to fly internationally. He was became based in Portland, Oregon by choice, allowing him to establish a vineyard that was a sensible commuting distance away from the Portland airport. His first trip to explore the wine districts of Oregon led him to the Columbia Gorge, where he discovered a 60-acre site that was perfect for grapevines. 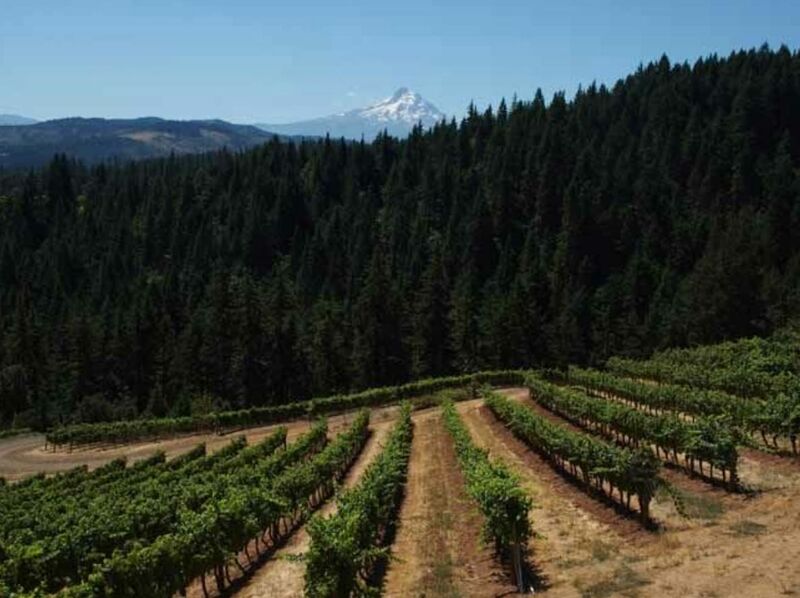 His research indicated that the Hood River Valley site enjoyed about the same rainfall and heat as Oregon’s Dundee Hills in the Willamette Valley although the existing vineyards for Pinot Noir in the Columbia Gorge sat at a higher elevation. Morus would admit that his planting of Pinot Noir, that began in 1996 on this site, was a “lucky, slightly educated guess at the time.” The first Phelps Creek labeled Pinot Noir was released from the 2002 vintage. Alexandrine Roy, who crafts wines in Gevrey-Chambertain at her family’s Domaine Marc Roy, became the Director of Winemaking beginning with the 2012 vintage. Her reserve wine, Phelps Creek Cuvée Alexandrine, is one of Oregon’s finest Pinot Noirs. Current production is primarily from estate grown grapes and is about 5,000 cases annually. A tasting room located on the grounds of the Hood River Golf Course is open daily. Visit www.phelpscreekvineyards.com. Chris London is a captain for United Airlines based in San Francisco, who along with his spouse, Karen, a former flight attendant, bought a property in the western reaches of Petaluma on Spring Hill Road in 1999. 20 acres of Pinot Noir were planted in 2001 including clones 777, 667, 115, Pommard 5, Swan, Camera and Wädenswil 2A. Karen shoulders a majority of the vineyard workload as well as managing 100-130 head of cattle on the farm. The Londons have the largest herd of Waygu cattle in California. Competing in U.S. national cattle competitions, the Londons have accumulated a number of first place ribbons. In 2016, grapes were sold primarily in 2 to 3 ton lots to 7 boutique wineries including Talisman and Waxwing Wine Cellars who bottled vineyard-designated Pinot Noirs. Spring Hill Vineyard grapes are highly sought after and producers are eager for more. Chris is enthralled with the farming aspects of the vineyard and has designed a number of tractor enhancements to facilitate vineyard management. 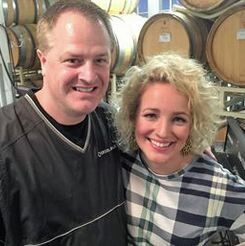 I profiled Brad Alper and his transition from airline captain to winegrower and winery owner this year: www.princeofpinot.com/article/1910/ and followed that up with a visit to his SP-SL Vineyard and Square Peg tasting room. Alper was a captain for American Airlines flying out of San Francisco Airport. Along with his spouse, Alanna, he had moved to the Russian River Valley in 1987 from Los Angeles to escape the city life. His schedule became brutally demanding, requiring him to commute to Los Angeles to fly B-777s to London, Tokyo and Shanghai. At age 52, with over 28 years of commercial flying, he decided to throw caution to the wind, retire early, and put all of his energy into a vineyard and wine production. Alper told me, “If I said that I never once looked back or regretted my decision I would be lying to you. It has been pretty scary at times, but there has been a lot of magic, and I am challenged every day. My life is much richer and I am a better person for sure.” He had dabbled in wine growing dating back to 1994 but decided to take it seriously. He budded over Zinfandel vines planted in a 12-acre former apple orchard on his property to a Calera selection of Pinot Noir and Dijon “828.” The inaugural Square Peg Pinot Noir was released from the 2013 vintage. Alper has engaged veteran winemaker Bill Knuttel to make his wines and is committed to dry farming his vineyard. By good fortune, the vineyard is located in what is now a highly regarded area for Pinot Noir just outside the town of Occidental near Stoetz Lane. 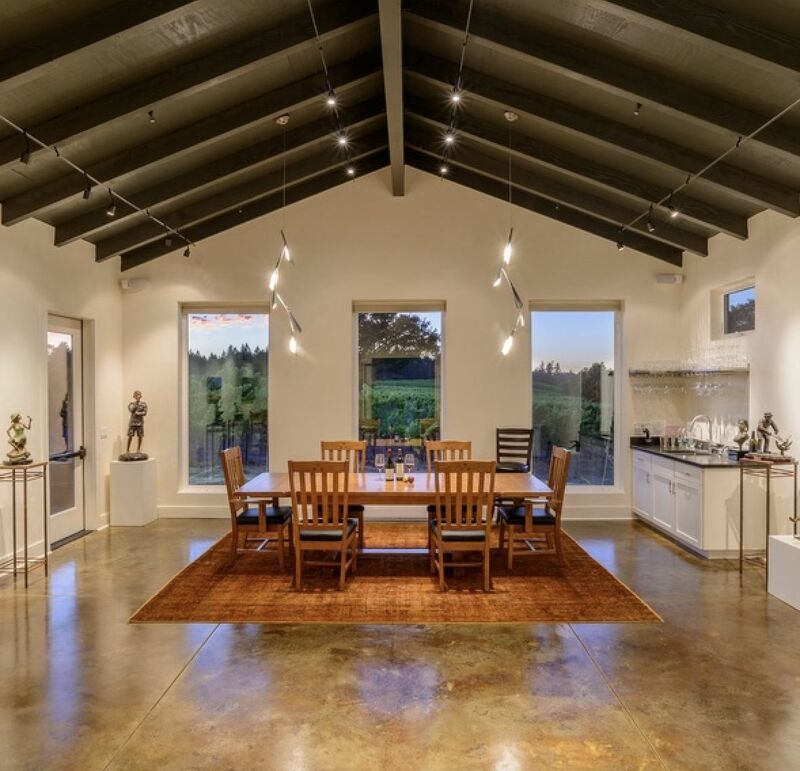 Notable vineyards include Chenoweth Ranch, Riddle Ranch, CIRQ’s Treehouse, Aubert’s UV-SL, Arista’s UV Lucky Well, and Dutton Ranch’s Morelli Lane and Fox Den. Alper estimates that the Square Peg Estate Vineyard (SP-SL) is located within seven miles of the top 1% of all California Pinot Noir vineyards. 35% of the top scoring Pinot Noirs in a recent issue of Wine Spectator were produced from grapes grown in vineyards that are located from 50 feet to 7 miles from SP-SL Vineyard. Visit www.squarepegwinery.com. The tasting room is open by appointment (pictured). The three wines tasted during my visit this year. The 2014 wines were noticeably better than when I tasted them early in 2017, showing much better oak integration with additional time in bottle and brought directly from the winery’s cellar.